Part one in a series of characters made in MK:Armageddon’s fun features called Kreate-A-Fighters (or Kreate-a-Kombatants as I keep accidentally calling it). I’ll eventually make this a feature on my ScrollBoss game site. Here’s Tyris Flare from Sega’s classic Golden Axe game. She’s easy to make since, well, she’s just about nekkid. That’ll keep the parts costs down. 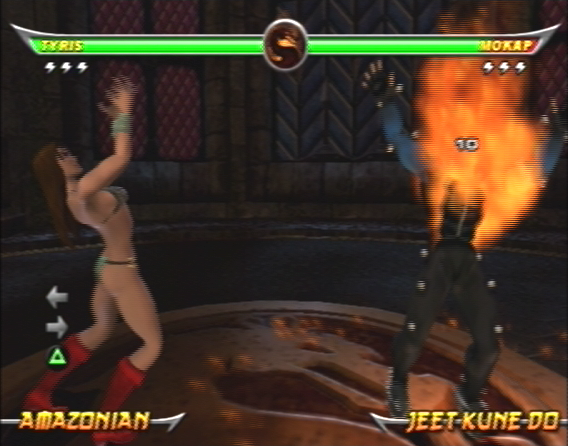 The moves get pricey since you’ll want to give her all kinds of firey super moves. I’ve kept the regular moves out for now since that takes a goofy amount of time. Also, everyone has their own playing style, so just pick what suits you. Just make sure that she’s mostly kicky without a lot of flourish. I also didn’t list the face tweaks yet since they’re barely noticable. If you use this to make a Tyris to use in an FAQ or net video, it’d be cool if you gave me a shout-out on it. Because, well, you didn’t. As long as you don’t claim that you came up with it yourself, I’m pretty much cool with it. Thanks for sharing your original character!